Tell the drummer on your list that you like his style! The drums virtuoso male brown hair personalized Christmas ornament in festive colors will put a smile on his face when received in our classic velvet gift bag. Our lettering pros add your custom details to these musical instruments ornaments personalized to be cherished mementos. 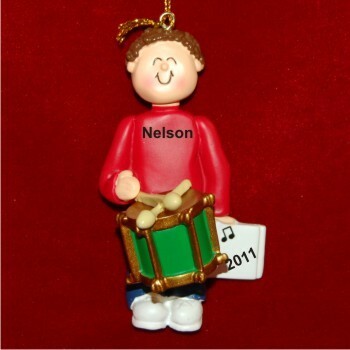 A golden cord is already attached for displaying the male with brown hair drummer personalized Christmas ornament wherever it makes him happiest!